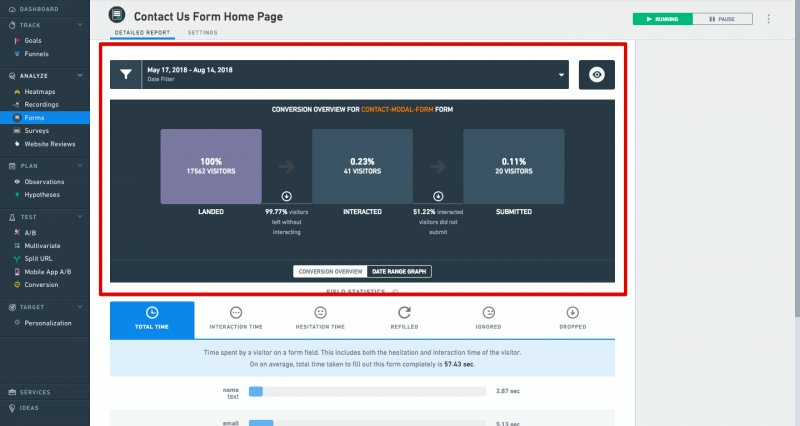 A Form Analysis test helps you analyze how visitors interact with forms on your website. Using the feature, you can track how visitors interact with forms, which boxes are filled first, and what causes drop-offs. Track reports of each field in the form. To open the Form Analysis dashboard, on the navigation bar, select Analyze > Form. The dashboard lists all the forms that you have tracked. From the listed forms, select the form for which you want to view the report. On the selected form’s summary page, click Detailed Reports. The reports page has two sections—Conversion Funnel Report and Field Statistics. 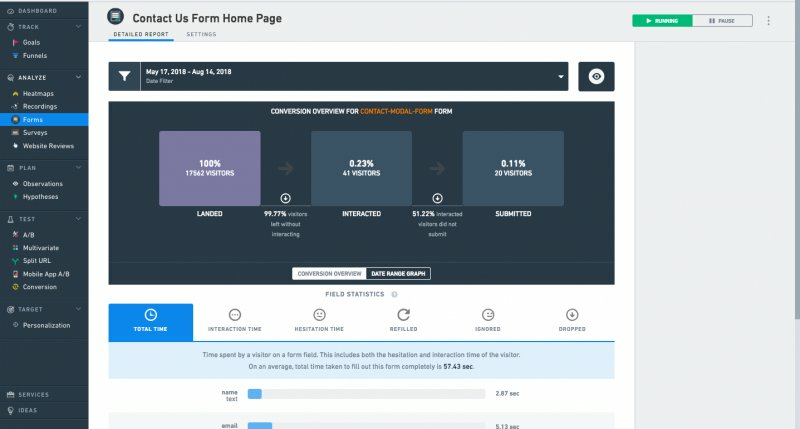 Conversion Funnel Report: This report explains how many people landed on a form, how many interacted, and how many clicked Submit. Field Statistics: The Field Statistics section provides detailed statistical data of time taken to complete a form, interaction time, hesitation, refills, ignores, and drop-offs. You can click any parameter to view the complete report. You can filter the goal reports based on dates if you have enabled the segmentation option for the goal. Select the date range for which you want to view the reports and then click Apply. Last month: View reports till the last date of the previous month during which the form was active and running. Last week: View reports till the last day of the previous week. By default, the weekly report cycle is from Sunday to Saturday. By default, the conversion performance chart displays the conversion rate data for the last two weeks. The report displays how many visitors landed on a form, how many interacted, and how many successfully submitted the form. You can apply the date to display the corresponding data on the performance chart. The Field statistics gives you detailed statistical data of time taken to complete a form, interaction time, hesitation, refills, ignores, and drops. You can click each parameter to view complete reports data. The average amount of time spent on each box of the form. This report combines both the interaction time and the hesitation time of each box. The average time a visitor spends interacting with each text box on a form. Visitors spending a long time on a simple text box, however, can indicate errors in the field, unclear or invalid prompts on what to enter, or that they are changing their answers. It is calculated when a visitor clicks a particular field or focuses on a field, using tabs, and starts typing. The average time a visitor hesitates while filling up each field in a form. If visitors are hesitating for a longer duration, it can mean the field is not clear. Ensure that the fields are understandable and easy to fill. It is calculated when visitors point their mouse to a particular field or leave the mouse idle over a field. For example, a visitor clicks a field, does not type anything for 3 seconds, and then types and completes the entry. In this case, the hesitation time will be calculated as 3 seconds. The percentage of visitors who entered data in an input box and then made changes to what was entered. For example, a visitor types something in a field, moves away from that field, and then returns to the same field and starts typing. It is calculated by dividing the number of refills by the number of interactions and then multiplying the result by 100. The percentage of visitors who submitted the form but left the field blank or did not change the default value. Text box entries are also considered ignored in case of failed submits due to validation errors. For such cases, use our API to tell us which submits are to be considered successful or failed. It is calculated by dividing the number of ignored boxes by the number of submitted boxes and then multiplying the result by 100. The percentage of visitors who did not submit the form and left while typing in a specific box. If more users are not filling a specific box on the form, it can indicate trouble or issues with the box. For example, if a visitor fills a box, say “box 2,” and does not fill “box 3,” then we consider the drop-off on box 3. It is calculated by dividing the number of drop-offs by the total numbers of visitors who interacted with the form and then multiplying the result by 100.